Since this Fall, the Law Library provides access to another database from the Making of the modern law series, Comparative and International Law, 1600-1926. It contains historical resources previously found only at the largest and oldest repositories. 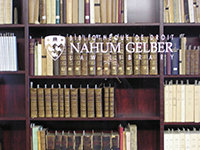 FCIL includes pre-1926 treatises and monographs, sourced from the collections of the Yale, George Washington University, and Columbia law libraries, in the following areas: International Law; Comparative Law; Foreign Law; Roman Law; Islamic Law; Jewish Law; and Ancient Law. in the Law subject guide. Who would have thought that it might exist? But, here it is: Utopia, Limited; or, The Flowers of Progress, an opera that lampoons limited liability companies and incorporation laws with by music by Arthur Sullivan and libretto by W. S. Gilbert. This second-to-last Gilbert-Sullivan’s performance was the longest-running production to premiere at the Savoy Theatre in the 1890s (245 performances). You can find more about this opera here. The McGill Book Fair, held each fall in Redpath Hall, offers tens of thousands of used books, French and English, in all subjects ranging from architecture to zoology. In addition to books, the Book Fair also offers CDs, LPs, DVDs, and sheet music. One room is devoted exclusively to art and architecture, and another to old and rare volumes. Thie fair supports a worthy cause (endowed student bursaries), and the selection of books is outstanding. In 2010, the annual Book Fair donation to the University was $75,000. Come, find a book for you, and support a good cause. Tuesday, October 23, 1 p.m. to 9 p.m.
Wednesday, October 24, 9 a.m. to 9 p.m.
Thursday, October 25, 9 a.m. to 9 p.m.
Our fall round of 1st year legal research sessions is almost over. For those of your who would like to learn more about techniques and methods of legal research or just to refresh what we have learned in September, I could recommend to use one of the legal research manuals. You can find a list of the most recent legal research and writing manuals in our Law subject guide. To find more books on legal research, you can browse our Reference and main collections for call # KE 250 and KF 250. Also, if you are writing you first legal research paper and do not know where to start, you may find helpful the selection of the Guides and aids for legal research in the Law subject guide. Here you can find topical guides that will help you to navigate through the research process (ex. UN research guide).